Jacob Kuehn describes the mayhem when violence broke out in the UN protected camp in Pibor, South Sudan. When heavy fighting broke out and bullets started flying around our medical centre in Pibor, South Sudan, Dr Marisel Mendez was treating a two-year-old boy in the paediatric ward, a concrete room with six hospital beds and cartoon drawings on the walls to make it a welcoming space for children. The young child was reliant on the oxygen machine and intravenous drip that Marisel was attending to for his survival. He had severe malaria, was extremely anemic and struggled to breathe. While caring for the boy, Marisel heard the first gunshots in the distance but stayed focused on her patient. As the sound of gunshots grew closer and closer, Marisel saw through the window that staff and patients were beginning to run towards the designated safe area of the Médecins Sans Frontières compound. Yet still Marisel stayed, sitting on the floor of the ward beside the child’s mother to stay low while attending to the sick child. She remained as long as possible, but eventually it became clear it was getting too dangerous to stay. Marisel also ran to the designated safe area, arriving as the first sounds of bullets whizzing through the air could be heard. 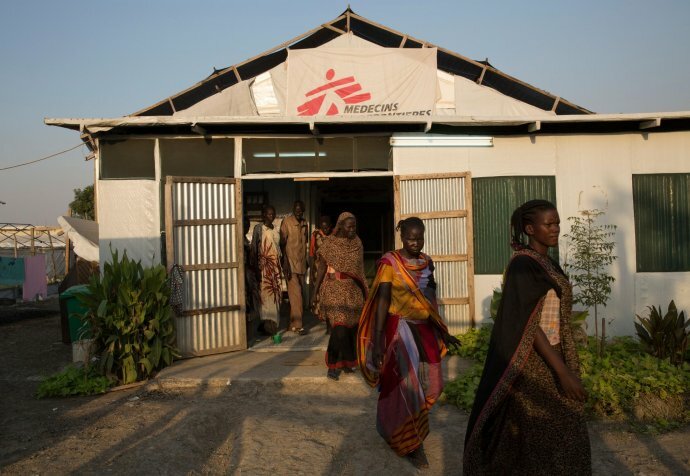 Fighting continued in Pibor for three days, from February 23rd to the 25th, but as soon as our team arrived in the UN compound they began supporting the treatment of wounded patients. One of them was a six-year-old boy, hit by a bullet in the stomach. Despite the best efforts of the medics who poured their energy into saving him, the wound was too severe and the child died the following day. The thirty-five other patients wounded in the fighting all survived. But as Marisel and our other nurses, midwives and logisticians were scrambling to provide life-saving care, the Médecins Sans Frontières medical centre that has served the community for over 10 years was being ransacked and looted to the point of being totally unuseable. Fans were ripped from the ceiling in the patients’ wards, electronic equipment and fuel were taken and all the therapeutic food used for treating malnourished children was stolen. Anything of value that was not bolted to the floor was carried off, even the hospital bed belonging to the two-year-old child that Marisel had been treating when the violence broke out. When the fighting subsided, our teams returned to a scene of chaos and destruction. Bullet casings were found throughout the compound. Life-saving medicines and essential records were strewn everywhere, while cabinets and shelves were tossed and emptied in a frenzy of theft and disrespect for medical care. Our medics at the UNMISS compound continued working, aware of rumours of looting at the health centre, but oblivious to the real extent of the damage. In any case, their priority was the patients in front of them needing treatment. In the days immediately following the fighting, a number of pregnant women entered premature labour and our doctor and midwife treated them to stave off early birth, which can result in complications and even the death of the child. Presently in the UN compound, women and children make up most of the two thousand people taking shelter. They have only one latrine for every 350 people, less than 1.5 litres of water per person per day, and no food distributions. But people stay here out of fear, and for some, because they know they have nothing left at home. “All I was able to take with me was one jerry can,” says Mary, sitting in the waiting area of our clinic that was hastily set up to provide a basic medical environment. She holds her sick two-year-old son David in her arms as she explains that her house has been burnt and she had to beg for plastic sheeting while inside the camp so that her family of six could have any shelter at all. With her house in town destroyed and all her possessions stolen, her family’s future is not clear. “We have nothing to build a new house with,” she says. Nearby, a woman named Yayo shares a similar predicament. She has brought her two-year-old daughter, Juang, to the clinic to be treated for diarrhea caused by drinking water from the river out of desperation. Though Yayo’s house is still intact, everything inside was looted, including all of their clothes and their last bag of sorghum: the only food they had. Pibor is a town of about 40,000 people but when the fighting started thousands of people fled, not only into the UN compound, but also into the bush. Two days ago, a child came to our clinic in the UN protection site with a snake bite on his ankle. The wound was necrotic and our doctor Henryk Bonte helped remove the infected flesh to prevent further infection. The boy had been hiding in the bush for several days since the snake bit him, too afraid to come back to town and look for help. Two other children arrived after hiding in the bush; they had been suffering from severe convulsions for days before their families felt safe enough to bring them in for medical attention. “People in the bush are terrified,” says Bonte.